This is one of the most amazing feats of precision shooting ever recorded. 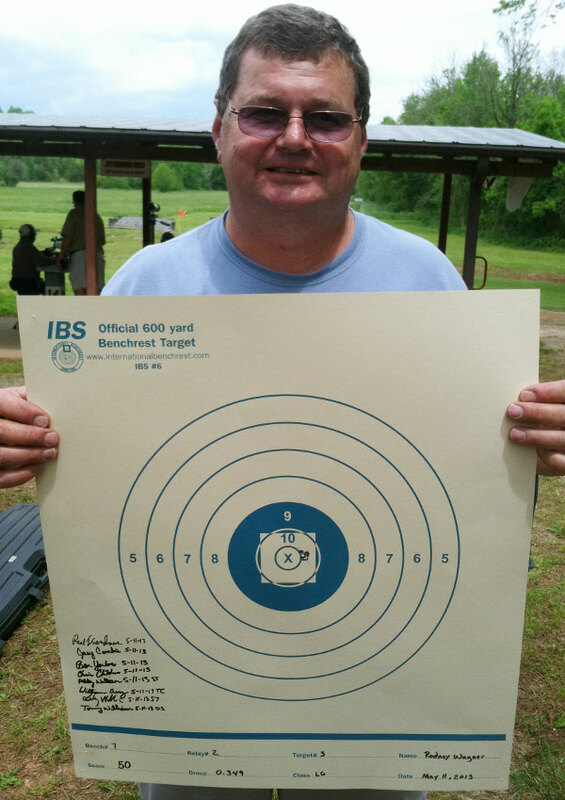 In an IBS 600-yard Benchrest match today at the Piedmont range (Rutherfordton, NC), Forum member Rodney Wagner shot a 0.349″ five-shot group at 600 yards. That smashes the existing 0.699″ IBS Light Gun Record (and it’s way smaller than the NBRSA record as well). To top that, the group was centered up for a 50-2X score, which establishes another record (50 score with small-group tie-breaker). Rodney (aka “Eggman” on the Forum) was shooting a 17-lb IBS Light Gun with a Brux barrel chambered for the 6mm Dasher, a popular improved version of the 6mm BR Norma cartridge. 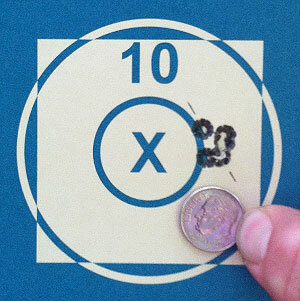 Rodney was shooting 32.5 grains of Varget, with CCI 450 primers, and Berger 108gr BTs, seated .020″ away from the lands. Here’s an interesting factoid: In 2008, Rodney’s teen-age son set the IBS 600-yard Light Gun record with a .711″ five-shot group, combined with an Aggregate of 1.628″. That Agg was itself an IBS record (until Chad Jenkins recorded an 1.5009″ Agg in 2012). Rodney’s son was shooting a 6BRX. 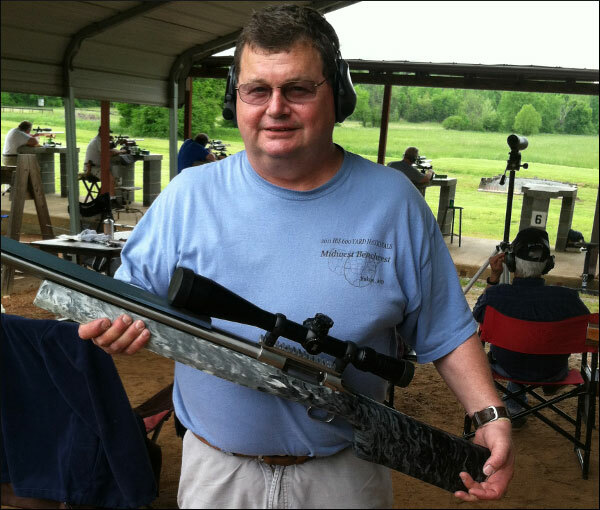 The 600-yard group record was then lowered by Rodney’s friend Sam Hall, who shot a 0.699″ group in 2010. Sam also set the current 600-yard LG score record with a perfect 50, but that should be eclipsed by Rodney’s 50 score based on tie-breaker by group size. Look at that target and try not to be astonished! When this editor saw the group, I was honestly stunned and speechless. Consider this, one MOA at 600 yards is 6.282 inches. 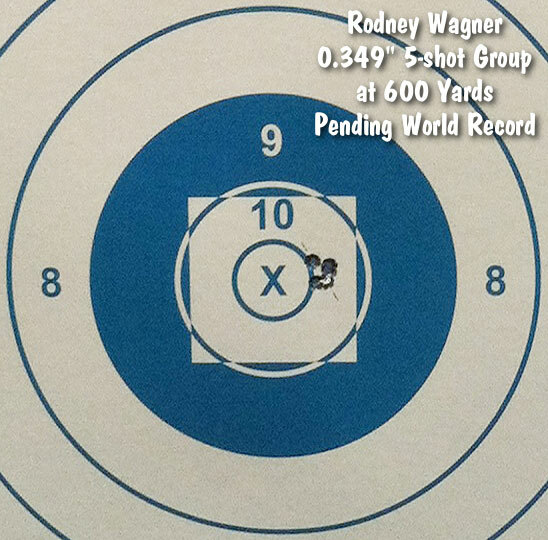 So Rodney’s 0.349″ group works out to 0.055 MOA. That’s what a mid-zero group at 600 yards looks like boys and girls…. Equipment: BAT Model B action (RBLP Rt Eject), Brux HV-contour barrel (29″), Jewell trigger, March 10-60x52mm (Tactical knobs, Burris Rings), Shehane ST1000 fiberglass Tracker stock. Load: Lapua 6mmBR brass formed to 6mm Dasher, 32.5 grains Hodgdon Varget, CCI 450 Primers, Berger 108gr Boat-Tails seated .020″ away from lands (jumping). Share the post "Amazing! Wagner Shoots 0.349″ (50-2X) Group at 600 Yards"
Now an important domestic ammo-maker has committed to a significant increase in production capacity. Remington Arms Company, LLC (“Remington”) recently announced a major expansion of its Lonoke (Arkansas) Ammunition Plant. Remington will spend $32,000,000 to add new structures and machinery. Work on the expansion, which will include the construction of a new building, is expected to begin second quarter of 2013. The $32 million expansion plan is projected to be in operation by the second quarter of 2014. The Remington’s Lonoke Ammunition Plant, opened in 1969, produces a wide variety of commercial ammunition. “We continue to invest in all of our manufacturing operations because we are committed to ensuring quality, increasing product availability, and improving on-time delivery. This significant investment in Lonoke is a testament to that commitment. Our customers can count on Remington to invest in its manufacturing operations in order to ensure that its facilities are state-of-the art”, said Kevin Miniard, Chief Operating Officer of Remington. Read about Remington ammunition. Share the post "Remington Announces $32 Million Ammo Plant Expansion"
As a Father’s Day Promotion, Bushnell is offering rebates on Trophy XLT and H20 full-size binoculars and a GPS tracker for hikers/hunters. CLICK HERE to learn more about these “Deals for Dad” which are valid from today (May 11, 2013) through June 16, 2013. Promo found by EdLongrange. We welcome reader submissions. Share the post "Save Money on Optics with Bushnell “Deals for Dad”"